Most famous for his role as lead singer for Pearl Jam, a band that formed a fundamental part of the grunge music scene of Seattle in early nineties, Eddie Vedder became a reluctant pop icon much like his then contemporary Kurt Cobain. Alongside Nirvana, Alice in Chains and Soundgarden, Pearl Jam became the "voice of the passion and fears of a generation" according to Time magazine, on whose front cover Vedder was featured in October 1993. However, despite huge success for all the bands listed, Pearl Jam's debut album, Ten, outsold them all, reaching platinum record sales 13 times over. Tackling difficult subjects such a depression and suicide, Vedder's lyrics touched the otherwise disenfranchised youth of Generation X, connecting people through music in a way that had not felt possible by other genres of the time. Born in Illinois but raised mostly in California, Vedder's first band, Bad Radio, although successful in his hometown of San Diego, never reached a larger audience. It wasn't until ex drummer from the Red Hot Chili Peppers, Jack Irons, connected him to the other members of the band in 1990, that Pearl Jam became a possibility. Iron's sent Eddie a demo tape of the band's music, to which he quickly penned some lyrics and gave his now infamous gravelly vocals. Among others, created on that demo was Alive, arguably the band's most beloved single. The existing band then known as Mother Love Bone, quickly swept their new front man up to Seattle instantly. As vocalist and song writer for Pearl Jam he has released 10 studio albums, and since going solo he has released a further two. 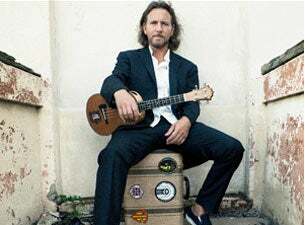 His first being the soundtrack album, Into the Wild, and 2011 saw the release of Ukulele Songs, a compilation of covers and original works in which Vedder performs vocals and accompanies himself on the ukulele. Influenced by a formidable list of rock icons such as The Who and The Clash as well as The Pretenders, whom Eddie claims seeing perform live changed him forever. He has since been honoured with the accolade of Rolling Stone magazine's number seven, in a list of best lead singer's of all time. He has performed at some of music history's most memorable concerts including Bob Dylan's 50th birthday bash, and in 1996 playing on stage at the last ever Ramones concert.